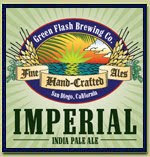 Beer Crusade is lucky enough to have reviewed the West Coast IPA from Green Flash a few months ago. I consider myself even luckier to have the opportunity to enjoy that beer's big brother, the Imperial IPA. As you'd expect from something with "imperial" in the name, this beer pushes the envelope on hop flavors and ABV (9.4%). The hops are ever-present in this beer, imparting a citrus-y flavor and a sensation of freshness. Despite the hop onslaught, this beer is very drinkable and quite tasty. Frankly, I think this is a great beer, and a top-notch example of a Californian IPA. The biggest downside is that the alcohol is a bit "hot" at times, giving a touch of "burn" to the flavor and drowning out a touch of the hoppy goodness.